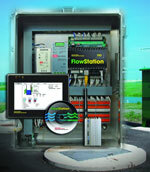 The FlowStation 110 from Control Microsystems is an out-of-the-box pump station controller package designed for use in storm and wastewater lift stations and common pump-up applications. The components consist of a pump controller, a color touch screen local operator interface, GPRS modem, SMS and e-mail alarming. An integrated BlackBerry interface is designed for central viewing and alarm acknowledgement. For larger water control systems, the package provides interface tools that exploit the product’s integrated Web server and Ethernet capabilities.